Add dramatic fire and flair to any outfit with this dazzling 1.36 Carat t.w. 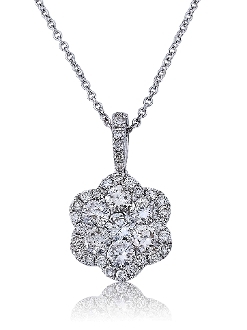 Diamond flower cluster halo pendant. Beautifully set in a unique open-back flower basket setting of 14 Karat white gold, and surrounded in a halo of smaller pave-set Diamonds, the five stone flower-shaped cluster of shimmering Diamonds grabs the eye and doesn't let go. Hanging gracefully from a Diamond lined bail, with bright polished shine, this pendant comes complete with a 16 inch cable chain that secures with a lobster claw clasp.